The Willi Scharpenberg Gallery hosts rotating artistic and historical exhibits year round. The Gallery was created to support the DANK Haus mission of preserving and promoting cultural heritage. We welcome submissions that attend to the German American or immigrant experience, cross-cultural projects, or other works/exhibitions that engage with cultural diversity. Artists interested in submitting a proposal for a gallery exhibition should carefully review the Exhibition Proposal Guidelines. All exhibitions must adhere to the Scharpenberg Gallery Guidelines and Policies. This exhibit focuses on the shifting geography of the Germanic space and how this relates to cultural identity. We present "Germany" (or Germanic lands, past and present) as represented by various maps over the years, mural paintings, woodcuts, and prints. The goal of the exhibit is for viewers to question how to define cultural communities in light of shifting borders and fluctuating national imagery. This exhibit is possible thanks to a loan from the German American Heritage Institute of two large painted murals from the Germania Club of Chicago. All other exhibit items are from the DANK Haus permanent collection. This exhibit is free and open to the public. 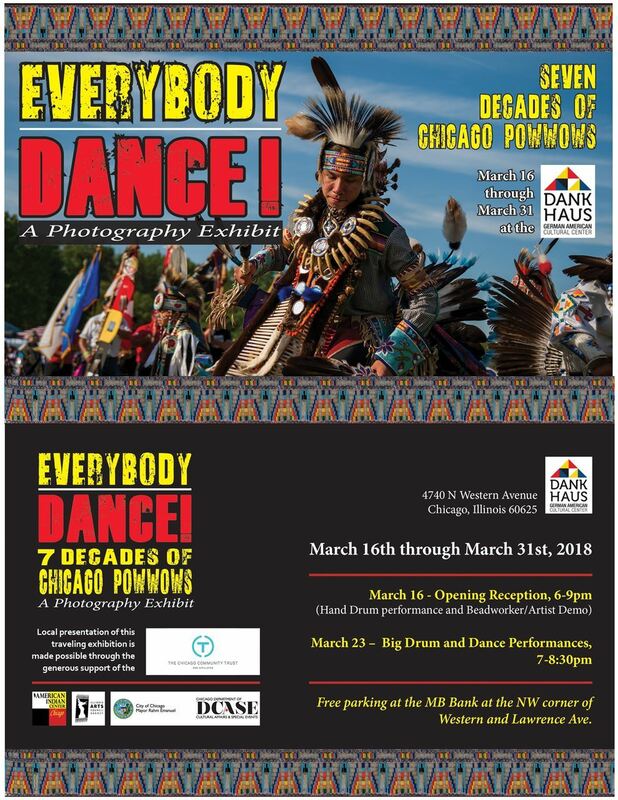 This exhibit will present stories from German-Americans around Chicago as well as material from the Eintracht German-language newspaper that was published from 1922 - 2017. The DANK Haus welcomes German artist Beate Axmann for a month-long solo exhibit. Axmann offers up a large collection of figurative and abstract work that is rich in content as well as in artistic expression. She merges tradition, native culture, and cultural tropes to produce a modern exhibit presenting her own personal connection and perspective on the Black Forest region. The exhibit hearkens back to a time of open borders and "Wilkommenkultur" (welcoming culture) that met new refugees in Germany. The opening reception will take place Friday, February 1st at 6:30pm in the 4th floor Gallery. Admission is free and open to the public. Beverages will be available for purchase. December 2018 through mid-January, 2019 "German Christmas Traditions"
We present a few highlights from German Christmas traditions: straw ornaments, clothespin ornaments, German Christmas foods, along with a few cultural myths. The exhibit is free and open to the public Monday - Friday, 1:00pm - 5:00pm. All photographs and display items are generous loans from members of the German-American community to help illustrate traditions from their own homes. Join us for the Closing Reception on Nov. 18th, 1:00 - 5:00pm! CLICK HERE to learn more. Join us on Sunday, October 14th, 1:00 - 5:00pm for a reception celebrating Chicago architecture. Chicago-based photographers and artists will present works inspired by the city's many architectural oddities. This exhibit is presented in tandem with the Open House Chicago event sponsored by the Chicago Architecture Foundation. Be sure to stop by the opening reception on Sunday. It is free and open to the public and drinks are available for purchase, so come and join us! 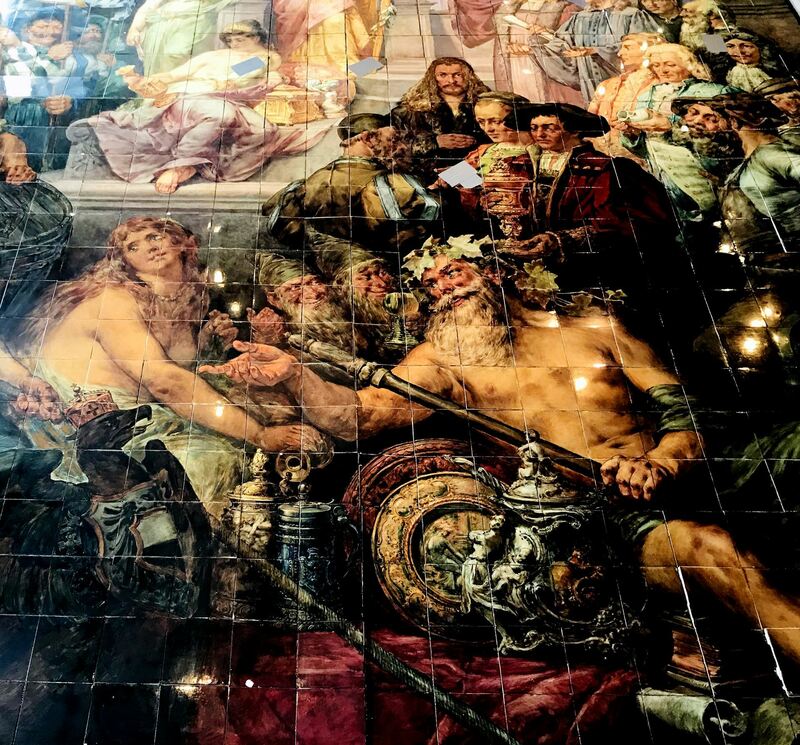 The DANK Haus is proud to host the Glory of Germania porcelain mosaic from the 1983 Chicago World's Fair in the 4th Floor Scharpenberg Art Gallery. This exbibit features 1,057 tiles that amount to 18 feet x 12 feet. It is open to the public Monday through Friday 1 - 5 PM. There is a reception for the exhibit at the DANK Haus from 7 PM - 9 PM on August 24th. It cost $5 and advanced registration is required. Please register here. 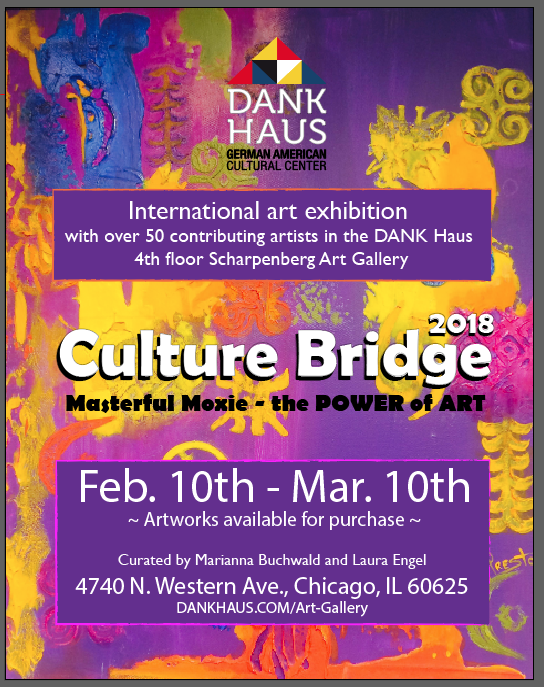 The DANK Haus is proud to host the annual Culture Bridge / Kulturbrücke once again in the 4th Floor Scharpenberg Art Gallery. This month-long international art exhibition features over 50 talented artists and photographers. These works are open to the public in the Scharpenberg Gallery Monday through Friday, 10:00am - 5:00pm for viewing and for purchase. Special weekend and extended evening hours will apply throughout the exhibition to events. Stay tuned for updates on weekly Culture Bridge events including musical performances, theater, and dance. The exhibition officially begins on Saturday, February 10th with an opening reception from 6:00pm-10:00pm. This event is free and open to the public. Exhibition curated by Marianna Buchwald and Laura Engel. 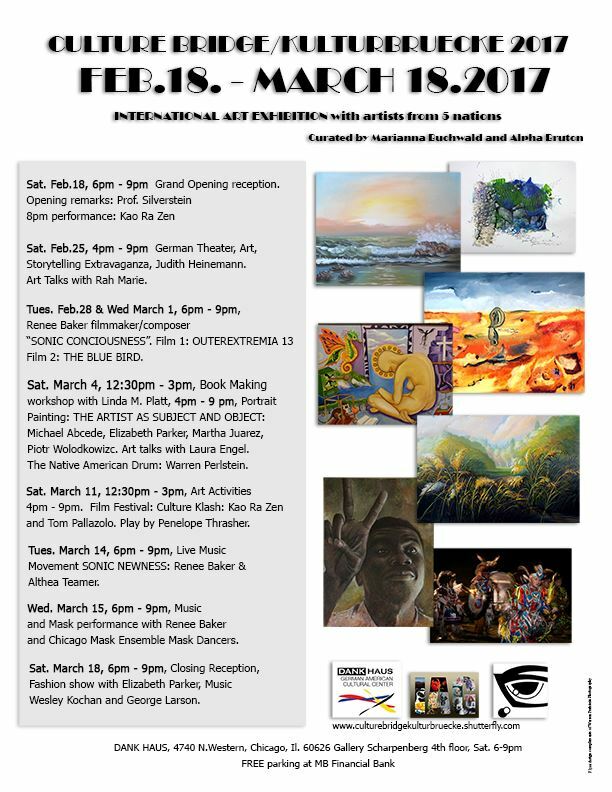 Culture Bridge Events: Click here for the schedule of events from Feb. 10th through Mar. 10th. In honor of our building's 90th anniversary, we delve deep into a history that is inextricably linked with the Lincoln Square community. Our exhibition showcases the life and work of our building's architect, German-American Paul Gerhardt, Sr., through a display of blueprints, slideshow of Gerhardt designs, and biographic memorabilia provided by Gerhardt's descendants. The exhibit also considers the Independent Order of Odd Fellows/Three Links fraternity who commissioned the building in 1927 as a temple. Taking the Order's early involvement as a point of departure, the exhibit invites visitors on an unforgettable stroll through DANK Haus history to the present day. Chicago's Families - "Community as Family"
Join the Chicago Cultural Alliance for an unprecedented citywide exhibit that presents a mosaic of voices, memories, and experiences of Chicago's Families. Spanning 6 sites across Chicagoland, 18 members of the Alliance use stories, photos, objects and more to reveal the many ways we need and love family, however you define it. The meaning of family applies to more than just the nuclear one. This exhibit examines the families we create through shared interests and activities including social clubs, festivals and celebrations. Hear the firsthand experience the festivities in traditional and religious Haitian holidays, vividly expressed by Haitian artists.